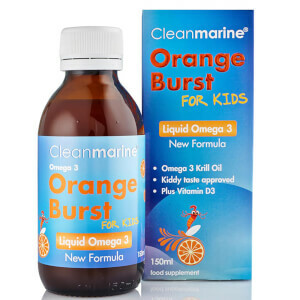 Cleanmarine Krill Oil for Kids Orange Burst Liquid Omega 3 is the world’s first flavoured Krill Oil liquid supplement specifically formulated for children with the added benefit of Vitamin D3, which helps build strong bones. It can be a challenge making sure little ones have a balanced diet and so this easy-to-consume supplement provides the perfect dose of Omega 3 fatty acids, which contribute to healthy heart, brain, eye and joint function as well as helping to enhance moods and improve concentration. Plus it’s sugar free, naturally sweetened with Stevia and has a delicious Valencia Orange taste! Why choose Krill Oil over Fish Oil? Krill are shrimp-like crustaceans that provide a more sustainable and ethical source of Omega 3 with zero by-catch. The fatty acids within Krill Oil are bound to phospholipids, a major component of human cell membranes, thus are much more rapidly absorbed than the acids from fish oil supplements. Krill Oil is also rich in Astaxanthin, a natural antioxidant, and there’s no fishy aftertaste. Free from all artificial colours, flavours and preservatives. 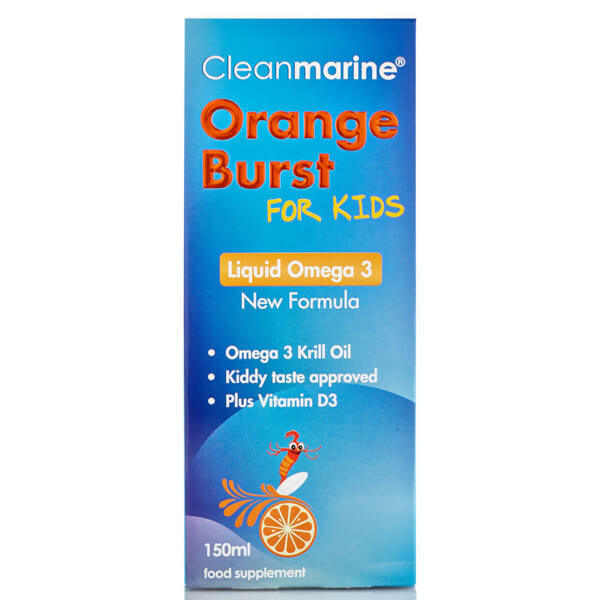 Every 5ml contains 200mg Krill Oil and 100% RDA of Vitamin D. Product contains a measuring syringe so it can be placed in the child’s mouth for application. Aged 3 years+: 5ml / 1 dropper daily. Aged 10 years+: 10ml / 2 droppers daily. 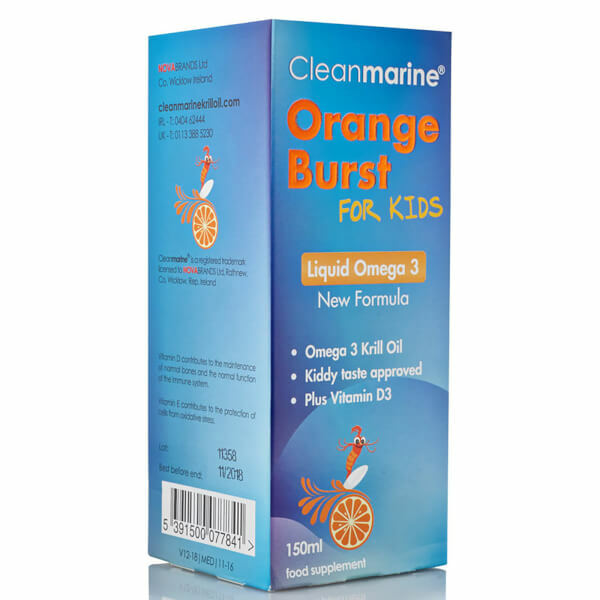 Sorbitol (Thickening Agent), Glycerine, Water, Euphausia Superba (Krill Oil, Crustacean), Modified Starch (Thickening Agent), Valencia Orange Oil (Natural Orange Flavour), Vitamin E, Beta Carotene, Phosphoric Acid, Vitamin D, Stevia Extract.